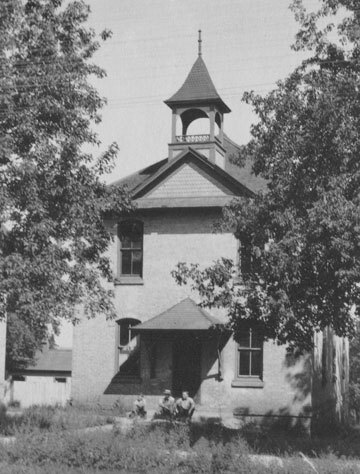 Mount Horeb’s old District No.1 Schoolhouse, built between 1884 and 1889, was replaced with a larger school building in 1919. The local Masonic Lodge used the former schoolhouse until 1921 at which time it was converted into a single family residence. In later years it became a 2-flat apartment building. 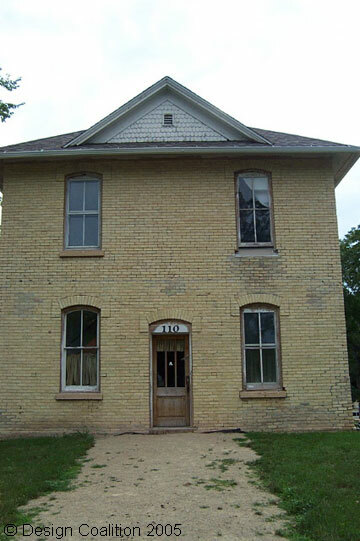 In line to be razed in 2002, the history-minded community decided that the “oldest remaining school building in Mount Horeb” must be preserved and had the 113 year old schoolhouse moved from it’s original Main Street location to a new park site behind City Hall. Left: Completed restoration in 2007. Once in place on it’s new foundations, local volunteers formed the Mount Horeb Landmarks Foundation to begin restoration work on the historic building. When the original school bell was donated by a member of the community, the MHLF was inspired to set as their next goal the restoration of the long gone bell tower. Lead Region Historic Trust was contacted to reconstruct the new bell tower but lacked accurate drawings to work from. A member of the community who had just completed a project designed by Design Coalition recommended they contact DC’s historical restoration designer, Mark Hinrichs, about putting together drawings. Above: The schoolhouse prior to restoration. Hinrichs studied old photos in order to accurately recreate the proportions and trim details of the long gone bell tower as well as investigating on site for signs of telltale marks and shadows on the “Cream City” brick to recreate the door canopy. The original bell tower had been removed while the building was still in use as a school due to it’s weight causing the roof to sag. Structural engineer, Don Frederick, P.E., assisted with the design of major reinforcement to the roof framing that was required for support of the rebuilt bell tower. 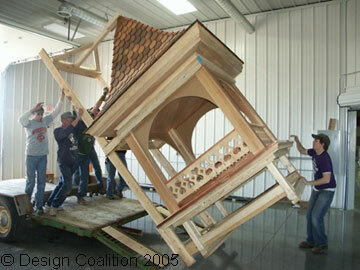 Many of the hours required to produce the detailed restoration design drawings were donated free of charge to the non-profit community project. 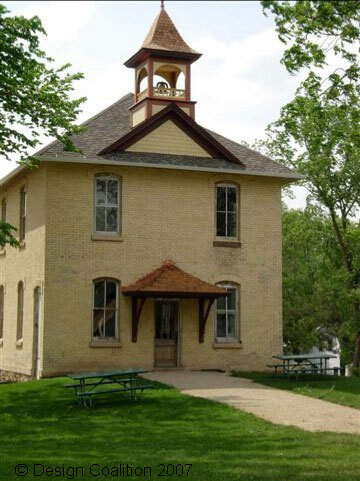 The historic schoolhouse is an important landmark in Mount Horeb that serves as a connection to the heritage of the village, keeping alive the history of the community for generations to come. It has become the focal point of Heritage Park and Gardens, a welcoming green area just off Main Street. The first floor of the building will include an exhibit to memorialize the one-room schools and honor the educators who taught in those schools. When interior renovations are completed, it will be available to local groups for displays, shows, meetings and other community events. Above: Unloading the newly built tower.